Next month the SWC is changing things up just a bit. We have a special guest! Maple Sudds, author of No Blood in the Turnip:Memoirs of a Codependent, will read selections from her book and hold a question and answer session afterward. This meeting is at a special time: 11:00 am. It is also in a special place: Shreve Memorial Library–Hamilton/South Caddo Branch, 2111 W Bert Kouns Industrial Loop, Shreveport. The meeting will be held in their lovely reading room. We’re really hoping this open area will invite people in to join us, to hear Maple and to find out what Shreveport Writers Club is all about. Mark your calendars for this special event! If you click on “going” or “interested” on the Facebook event, you will receive a reminder about it from Facebook. You can also invite friends through the Facebook link. Remember, you can help promote the club and it’s events by sharing information about club activities on social media OR by simply inviting a friend (or two) to join you at a meeting. The Shreveport Writers Club held their regular monthly meeting at 10 am on Saturday, November 3rd. This month the writers met at Retro 521 Cafe in Bossier City. Club President, Tiffany Pennywell, welcomed visitors and members. The first order of business was presenting the “Making a Mark” awards. Members who submitted any piece of writing to any publication are given a commemorative writing pen as encouragement. Writers this month “making a mark” were M. L. Dumars and Loretta Casteen. After members shared their writing, the group moved on to other business. The December Holiday meeting location was discussed, but not decided upon. Those interested are encouraged to check back on this site or on the Facebook group once the meeting place for December is finalized. The December Holiday meeting will include the yearly potluck meal, games, readings and fun. Special guest for the December meeting will be novelist, Maple Sudds, who will discuss self-publishing her memoir No Blood in the Turnip. Next, club Vice-President Deondre Holmes announced the winner of the October short story contest. For her short story, “Windows” Stephanie Bullard won a $25 gift card and spooky Halloween shot glasses. The theme and deadline for the next contest will be announced at the December meeting. The writers then participated in another writing activity. Each person was asked to write for ten minutes about their “perfect writing situation.” Afterwards, writers shared their work, if they wished to. 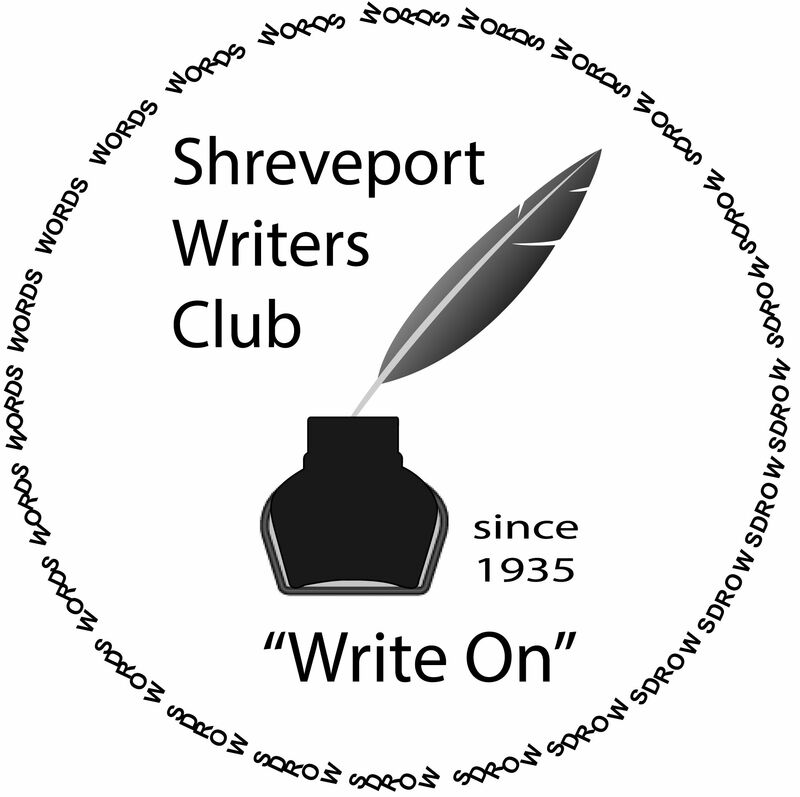 The Shreveport Writers Club Critique Group will be held at Retro 521 on Saturday, November 17th, from 10 am to 12 pm. Vice-President, Deondre Holmes also invited anyone interested in evening meet-ups back to Retro 521 every Wednesday evening in November from 5 to 7 pm for critiques, sharing work and encouragement during NaNoWriMo. The final activity was the Round Robin reading. Anyone who brought writing to share was encouraged to do so. The Shreveport Writers Club met for their September meeting on Saturday, September 8 at Shreve Memorial Library’s Broadmoor Branch. After greeting visitors, the monthly “Making a Mark” awards were handed out to members who submitted or had work accepted for publication. Receiving a “Making a Mark” award this month were Rob Hudgens, Tiffany Pennywell and John Brizzi. Rob received the award for having his first piece of fiction accepted for publication. Tiffany earned her pen by self-publishing her second book of poetry and John for starting a new blog. Congratulations to everyone. The group then moved on to the Flash Writing Exercise. Members and guests were invited to write for ten minutes on several provided prompts or to write on any topic they chose. Several of the group shared their writing afterward. Ken Shively shares on the topic he chose “I Shouldn’t Have Opened My Mouth” after the Flash Writing Exercise. After a brief business discussion, President Tiffany Pennywell introduced the Guest Speaker, Caddo Parish Poet Laureate Ashley Havird. Havird is an award-winning novelist and poet. She spoke to the group about her writing process and the discovery of “self” within her poetry and longer fiction writing endeavors. Havird shared several new poems with the group. She then opened up the floor for an informative and lively question/answer and discussion session. Members discuss writing and the writing process with havird. In the Round Robin portion of the meeting, several group members shared examples of their recent works or works-in-progress. The next Shreveport Writers Club Critique group will be at Shreve Memorial Library Broadmoor Branch on Saturday, September 22 from 10am to 12 pm. In July we held our Shreveport Writers Club Meeting at Rick’s Records. There, Rick gave us a pep talk about how to follow our dreams as writers. He also told us not to listen to other critics or even our own negative thoughts when it came to our writing. Rick also shared his experiences with publishing traditionally and self-publishing. We want to thank Rick for sharing his space and, wisdom and experience with the group. We also want to give a shout out to a couple of members who gave readings at the Agora Borealis this month. They did a great job and I hope they continue sharing their work. On August 4th, Saturday, we will be meeting at the Broadmoor Library. From 10am-12pm, come out to work on flash writing, have a discussion with us and share some of the work you’ve been focusing on. We will also be giving an update on the secretarial position. Visitors are always welcomed and remember to “Write on!”.